October 16th 1946; at Nuremberg, Germany, 10 high-ranking Nazi officials are executed by hanging for their crimes against humanity, crimes against peace, and war crimes during World War II. 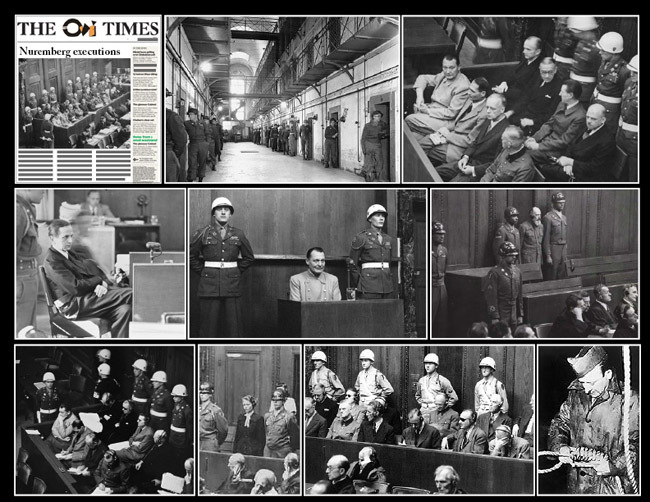 Two weeks earlier, the 10 were found guilty by the International War Crimes Tribunal and sentenced to death along with two other Nazi officials. Among those condemned to die by hanging were Joachim von Ribbentrop, Nazi minister of foreign affairs; Hermann Goering, founder of the Gestapo and chief of the German air force; and Wilhelm Frick, minister of the interior. Seven others, including Rudolf Hess, Adolf Hitler's former deputy, were given prison sentences ranging from 10 years to life. Three others were acquitted.